Thank you kindly for your script. But using the secret setting in the new Google Music doesn’t seem to work on either FF or Chrome. Hello Eugen – I haven’t had any other comments about the secret setting not working, nor can I reproduce what you’re seeing. Are you still experiencing this issue? I’m experiencing the same issue. No option for last.fm appeared anywhere for me after installing the script. Nvm after another restart of my browser it showed up. Wonder if this is currently down/broken? Have restarted browser, reloaded window, double checked that extension is installed, does not scrobble. It’s not on last.fm’s end, scrobbling on my phone works fine. Hello Tore – Thank you for letting me know it wasn’t working. I’ve updated the script to fix the change Google made to the player. To see the update you’ll need to restart your browser. If you see anything else funny with it please let me know. I guess that it’s not a big issue to adjust your tool. Hello Winfried – Thank you for letting me know it wasn’t working. I’ve updated the script to fix the change Google made to the player. To see the update you’ll need to restart your browser. If you see anything else funny with it please let me know. It won’t scrobble in my Firefox. Hello Smerkos – Thank you for letting me know it wasn’t working. I’ve updated the script to fix the change Google made to the player. To see the update you’ll need to restart your browser. If you see anything else funny with it please let me know. Apparently both the Last.fm integration and donator track skip functionality have stopped working. Also, after I tried to reauthenticate when trying to fix the problems, the addon no longer shows the donator options. Hey there, Daniel. Just installed your script this morning, but it doesn’t seem to be working for me. Another scrobbler I was using recently for Google Play also seems to have broken, so wondering if they’ve changed something their side? Cheers, Bob. As of today this isn’t working for me, dunno if google pushed an update or anything. Yesterday was fine. It seems like it may be on last.fm’s end, there’s a large lag between starting a song and it appearing there. I have noticed there is no scrobbling after redesign of Google Music that was done a few days ago. I tried both versions of Chrome – stable and Canary too, but unsuccessfully. Does it have connection just right with last change of Google Music? Can confirm that the same is happening with Firefox 38. It looks like a pretty significant redesign! Hello hemmer – I just updated the script this morning, and it should be functioning again. To see the update you’ll need to refresh Google Play. Could you change the Last.fm text position and its colors to adjust it to the new interface of Google Music? I have just made a donation 🙂 Good job! Hello koras – I’ve updated the UI of the scrobbler to better match the new “Material Design.” To see the update, simply refresh Google Music. If you have any other questions or suggestions on how it looks, please let me know. Doesn’t work anymore with new Google Music Material Design. Hello dKenGuru – I’ve just updated the script. If you restart your browser or refresh Google Music you should get the update. If you have any other questions please let me know. Is this still being supported? Because I can’t seem to get it to work. Mac 10.9.4, Firefox 38.0.1, Greasemonkey 3.1. Authenticated fine and the info on your Last.fm drop-down on Google Music looks accurate. But nothing has been scrobbling for the last 20 min. Hello Trine – Google released an update to their music player this week, which broke the script. I’ve just released a new version and it should work again. You should just have to refresh Google Music to get the latest script, assuming you still have it installed. Hi, the most recent update to Google Music breaks this on Chrome. Hello Tore – There’s a new version to the script. You should just have to refresh Google Music to see the update. If you have any other questions please let me know. Hello, I’m using this extension and very satisfied with it. However, it’s not working with new version of google music. I’ll be happy if you make a new version for it. I’ve updated the script, and scrobbling should now work again. You’ll need to refresh Google Music to see the update. Hello Geoff – I’ve updated the script, and scrobbling should now work again. You’ll need to refresh Google Music to see the update. Hello Ky6uk – I’ve updated the script, and scrobbling should now work again. You’ll need to refresh Google Music to see the update. I was wondering if you’d consider adding Libre.fm support to your extension? I’m increasingly concerned about last.fm shutting down, and am looking to transition. My Android scrobbler supports both so I just need a way to do the same for Play Music. In case of classical music, Play Music makes a distinction between composer and artist. Your script scrobbles artist but I think it should scrobble the composer instead. Hello John – That gets a little tricky since if you’re listening to an album that is a mix of music, such as “Now That’s What I Call Music 45”, then the album (or “composer”) is reported by Google Play as “Now That’s What I Call Music 45” and not the actual artist of the song. I do agree that in the case of Classical music the composer should be scrobbled, but I don’t know a way to check for that as the options/values in Google Play are limited as it wasn’t intended to scrobble. Love this – it was just what I was after. Having just converted this into a Safari extension with no real effort though I think you should get right on that :P. I just loaded the script you link to above with a domain and url rule for play.google.com. Works a treat. Does it support “loving” tracks at all? There should be a little heart when you’re playing a song in the script’s bubble in the top right. Some people have reported that the heart does not show up. It may be that you have it running in Safari that it isn’t fully working. If you mean to simply post on your timeline what song you’re listening to, you can have Last.fm do that automatically for any loved tracks. In that case, you could just thumb up a song on Google Music, it would be Loved on Last.fm, and then posted to Facebook. Do you mean to actually share music? The ability to physical share the files probably would break multiple Terms of Services with Google or the original source of the music, so I have no intention to release a script that would do that. Does this sync play counts? Hello Brnd – The script only knows about existing plays while it is running, and will not be able to scrobble for past plays (or past play counts). Recently (when I’m paying attention) in Google Chrome it’s not scrobbling every song. If I see that it missed one I have it play next and it will play and does scrobble then. Iit’s not any particular songs, it’s just here and there. I first “noticed” it over the weekend. Listening to a few album, only 9 songs scrobbled from 11, for instance, on a couple of different albums each. It continues to happen today. I am not noticing it happening with the other scrobbling medium (android “simple last.fm scrobbler”) I use. I’m trying to identify how often and what conditions it’s happening in. I’m having the exact same problem, not all songs are being scrobbled. I can’t identify a pattern either, sometimes the same song gets scrobbled, sometimes it doesn’t. Somedays all songs are scrobbled, some days it fails sometimes. Same problem here, not all tracks are being submitted, and I can’t identify a pattern, seems random. Anyway I can help diagnose the problem? I’ve exactly the same problem as Maisy reported. Then I think it concern others as well. I’m getting double and triple scrobbles for songs the last couple days. Am I alone? I’m having the same issue. Reinstalling the script doesn’t bring back the UI but, as you said, it appear that my plays are still being scrobbled. Hi Daniel, “last.fm requires authentication” doesn’t appear to me. I followed the steps of installation, closed Firefox several times and even tried to re-install Greasemonkey and your script. I’m using Windows 8 and Firefox 29.0.1. Thanks in advance! I’ve just updated to Firefox 30.0, still not working. Hello Gloria – It seems as though Firefox 30.0 and Greasemonkey 2.0 have been conflicting with my scripts lately. I’m looking into a solution, but I have not been able to successfully reproduce the problem. You’re awesome, just know that. No longer loads or works. Same here. Except, at least in my case, all I can say is that none of the UI of the userscript is visible. Tampermonkey indicates that the script applies to the current page (via a “1” overlayed over its icon), which would make me think that it’s loaded. If it’s working or not, I wouldn’t know, because I haven’t been able to set it up yet (a little hard to do with no UI). Please let me know if this is fixed. I used to like this extension and was hoping to use it for the first time in a while today. Yes, not working for me as well unfortunately. Has Google changed their page layout again or something? As of today, my windows7 chrome has decided to block all non store extensions, making your extension non-functional. Hi dude, your script stopped working for me. I saw on the changelog that a new version was released yesterday, but I uninstalled the previous one and tried to install again but, I’m still getting version 7/31/2013. Hello Obedi – There are two version of the script, one being the client and the other being the server. The current client version is 7/31/2013 which should be the one you have installed. The other version is the server, which is what the change log is showing. If you have any other questions please let me know. I really like this script and I have donated! One suggestion I do have though is changing the player name and icon on Last.fm. Hello Charlie – Thank you for the suggestions. I’ve went ahead and made those updates you requested, and you should now see the updates to the logo, url, and the name of Google Play Music. If you have any other suggestions please let me know. Hello Charlie – Thank you for letting me know! I’ve fixed the cosmetic bug you were seeing and everything should be all set. To see the update you’ll need to restart your browser. Update: It still works on my Windows 7 laptop, but doesn’t work on my Windows 8 device. I am pretty sure that it was previously working on the Win 8 device but I’m not 100% certain. This appears to be the same as the version that works OK on the Win 7 laptop. The script seems to work on the Win 8 device when Chrome is launched in Windows 8 mode, but not when in “desktop mode”. I don’t really understand the technical differences so I am afraid I can’t be of any further help. This is probably a dumb question, but will this script scrobble Google Music plays from the GM Android app? Or does it only scrobble activity originating from the GM browser client? Hi Daniel, thanks for the great extension! Does exactly what I need. However I’be been experiencing the following issue lately: random scrobbles end up missing. It has happened on two different machines. Have you encountered this before? Hello Kirill – Sometimes if Last.fm doesn’t recognize the song (sometimes based on character encoding) it will skip them. I haven’t been able to find a great way to fix that, sadly. Whenever Last.fm doesn’t recognize the song the heart will turn yellow with an exclamation mark. Are you seeing that on those songs? In my case repeatedly scrobbling the track which wasn’t submitted before will most likely succeed. And I don’t have the heart icon — I’ve just learned about its existence from this page. Is it possible to support Opera (legacy presto version)? I am understand that it is a “dead” piece of software now, but I am use it and it is the only browser that fulfill my needs except support by developers. It is already support greasemonkey scripts in a some way, so I guess it is possible to get this script running. In any way, thank you for your work. Hello kryksyh – The only way it would work is if Opera (that version) has a supported user-script addon similar to Greasemonkey or Tampermonkey, but for Opera. From a quick Google search it does look like it may be possible, but you’re about to travel down a road I am not familiar with. Older versions of Opera with the Presto rendering engine I believe will run userscripts without any addons. Thanks Daniel for the script. Very useful. Do you know of any way to import Last.FM Loved Tracks into a playlist for Google Music? I’ve tried to install this in Firefox several times today, and I am just not seeing the Last.fm authentication button. Any advice? I’ve restarted Firefox twice. And I already had Greasemonkey, so I know that part is fine. Nevermind, I just restarted one more time and it showed. Odd. Evidently it wanted me to start the browser *without* a Google Music tab already open from the last session. Hello Deb – I just released an update moments ago. You’ll need to restart your browser to get the update. If you have any other questions or it still doesn’t work please let me know. Hi, for me the icons at the top right of the Google Music page are no longer displaying, but it still seems to actually scrobble OK (at least it appears so from the Last.fm page!) Not sure if this is only since the last update on 10th March since not used it for a week or so. Hello by_tor – I just released an update moments ago. You’ll need to restart your browser to get the update. If you have any other questions or it still doesn’t work please let me know. Hi Daniel, it’s looking good now. Thanks again for your quick update. I see in the changelog that you’ve updated the script, but in the js it still says July 31. Hello Jan – There’s two version of the script, one being the client and one being the server. The update only altered the server, and so the version in the script itself is still listed as July 31. To get the latest server update you’ll simply have to restart your browser. If that doesn’t fix it, please let me know. Hello Alex – I just released an update moments ago. You’ll need to restart your browser to get the update. If you have any other questions or it still doesn’t work please let me know. I don’t know if this is problem on my end but lately the plugin is not properly aligned with the other icons anymore. Very nice. Works like a charm. I might even donate after further testing. Cheers. Thanks a lot for your script, it works well, and is very useful. Is the lyrics panel not working for anyone else? I know from my Google Search history that it’s searching for it but it never appears. I’ve disabled AdBlock and it’s still not showing up. Any suggestions? I’m using the 7/31/2013 client, and I don’t see any love/unlove heart icons. Any suggestions for troubleshooting/fixing? Hello Sean – This has been a sporadic problem with others as well. I’ve looked into it but I cannot seem to reproduce the problem. I may just have to re-write that part of the code in the near future. This is happening to me as well. One thing I’m using is the google music labs feature to use 5 stars instead thumbs up and down as ratings. Don’t know if that helps or not. Daniel – where *should* they appear? Can you post/link a screenshot of what it looks like when everything is working properly? I have a feature request: Google Music gives you suggestions on tracks meta data, album name and such, but you can use the suggestion only on one song at a time. Is their a way to get you script to change a lot of songs to Google’s suggestions as a batch job? Would be helpful if a album you copied from you personal CD collection was not correctly recognizes by the CDDB. Anyway, awesome script! Thanks for all your work! Love the latest update and the design! Hello Clemens – That’s a good suggestion, but I’ve tried fetching track meta data through Google Play before in hopes to use it as the Last.fm data without any luck. If I ever figure out where in the DOM/source Google is storing that, it’s possible I could do something with what you want. However, digging through their source code is very tedious. Just noticed it today and it looks amazing! Nicely done! Was baffled as to why it wasn’t showing up, but now all is well. Thanks for the fix! Can I buy you a coke? I can’t get the script to work. It’s enabled in Tampermonkey … I had uninstalled chrome due to something else, reinstalled it, now I add the script to tampermonkey and on my Google Music pages tampermonkey is running the script but nothing shows up anywhere on the page for last.fm. Nothing. Restarting browser and such hasn’t solved it. OK, well I unistalled tampermonkey and reinstalled it and your script. 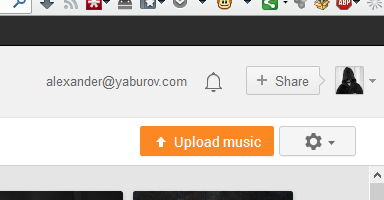 Played something, it’s scrobbling, but there’s NOTHING on my Google Music Page to indicated anything about it. Latest update is broken for me. 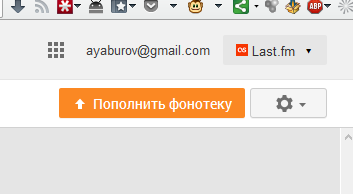 There is no “Last.fm” button in my Google Apps account. Hello Alexander – Did any of my recent updates get the script to work for you? Google changed the DOM structure again and it works fine now, thank you. I cant see the “Last.fm” too. Is there a way to see the error messages if there is one? I like your latest update, the new look fits in well with the latest Google redesign.